An earthquake is the most extreme condition that any building may be required to survive during its lifetime. To survive the natures might safely and surely also poses the greatest challenge to the architects and structural engineers. However the modern day computational power and the technological advances in the earthquake protection industry has made the solution once considered un-surmountable a reality. There are numerous companies specializing only in Earthquake Protection. Today most medium and high-rise buildings are following Life-Safety Design, more popularly referred as Earthquake Resistant Design for protection against earthquakes. However the awareness amongst people living in the seismic regions is increasing and they are now aware that for a small additional cost they can get a much higher Earthquake Protection for their buildings than what is mandatory as per the seismic codes. As the seismic codes are based on the Life-Safety / Earthquake Resistant design so they are aiming to prevent a total building collapse in case of a major earthquake, thereby saving lives. For the user/owner of the property this implies that even an Earthquake Resistant building does not provide any guarantee that it would be habitable for living / doing business after a major earthquake. The earthquake will structurally damage the building and incase the damage is above a threshold level there would be no option but to demolish and re-construct. The architects and structural consultants are therefore are no longer designing only to meet the government building code requirements but are going by the seismic performance criteria being demanded by their clients, in addition to the mandatory requirements of the building codes. Building codes are applicable to all buildings at large belonging to all strata of society and therefore the socio-economic conditions need to be carefully looked into before formulating them. For this reason it is not possible to lay down the stringent earthquake safeguards as many would not simply be able to afford the associated cost. The risk assessment exercises by the major insurance companies and financial institutions is another factor encouraging people to reduce risks by going in for the state-of-the-art earthquake protection technologies. Businesses want to limit the threat to their employees as well as cover their business against losses due to earthquakes. The insurance companies world over are refusing to guarantee such losses unless the buildings which house these businesses adhere to enhanced safety standards. The reduced insurance premiums and financing at lower rates of interest more than compensates for the cost of enhanced earthquake protection in the long run. Most earthquake protection devices come with a warranty of upto 35 years which can be further enhanced after a performance related test when the initial warranty period gets over. Typically the life of earthquake protection devices is greater than the life of the building per se. In United States it is mandatory for the computer data centers mushrooming all over to be designed to withstand the severest of the earthquakes as they house the sensitive data of not one but many hundreds of businesses. The repercussions of not designing buildings to withstand earthquakes are grave. Similarly the US government has laid down very strict compliance criteria for seismic performance of hospitals; they say "you cannot have deaths due to building collapse in a place that is meant to treat earthquake victims". Various government departments are also paying a great deal of attention on keeping essential infrastructure like public buildings, bridges and airports operational even in case of a major earthquake. "Immediate Occupancy" and "Fully Operational" during and post a major earthquake is the criteria that is spelt out for important structures. The architects and structural consultants are then asked to meet these criteria. This design concept is also known as Performance Based Design. As the awareness and economic prosperity is increasing, more and more people want to reduce risks. Not to forget the urge of many upwardly mobile to live in high-rise buildings away from the pollution and noise with their balconies overlooking the cityscape giving them a sense of achievement, superiority and contentment after a tiring days work. However many have started to realize the peril of staying in a high-rise, they become more vulnerable to the seismic effects. Vulnerability can be explained by taking the example of Dubai, 10 years back when high-rises didn't exist, people use to only come to know of the earthquakes happening in Iran through Newspapers, now with numerous buildings 25 storeys and more their have been instances when the buildings have undergone evacuation because of excessive swaying even for medium intensity earthquakes happening in Iran. 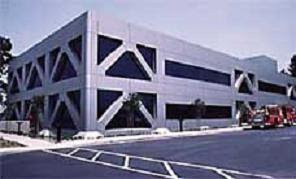 A major earthquake will almost certainly cause great structural damage in buildings not incorporating the safe guards. For enabling the architects and structural consultants to undertake Performance Based Design the client would have to spell out two parameters i.e. Peak Earthquake Intensity and Perceived Distance of the building from the earthquake epicenter. Typically a 6.5 magnitude earthquake with its epicenter 50-100 Kms away is considered good protection criteria. Some may contend with having their buildings designed to resist upto 6.5 magnitude earthquake on the Richter scale where as another person would demand a structural performance even in the case of a magnitude 8.0 earthquake simply because he/she is not willing to accept the associated risk that the earthquake damage may expose him to. The structural consultant then selects an appropriate set of "earthquake time-histories" recorded from earlier earthquakes and designs the structure by undertaking "Time-History Analysis" such that the inter-storey displacements always stay in the elastic range, thereby implying No/Insignificant structural damage even during a major earthquake. Buildings not employing advanced earthquake protection will most certainly sustain high degree of structural damage as the only way the earthquake energy can be absorbed by any building is by way of causing some damage. When a building is subjected to a major quake, energy is absorbed by cracking of concrete and elongation of steel beyond the elastic limits. This damage to the structural members if beyond a threshold level can be dangerous. There does exists another way of absorbing earthquake energy i.e. Dampers. The most efficient and cost effective way to achieve energy dissipation in buildings is by using Earthquake Dampers. Dampers are mechanical devices that look some what like huge shock absorbers. Dampers function is to absorb and dissipate the energy supplied by the ground movement during an earthquake so that the building remains unharmed, their functioning is also akin to shock absorbers. Whenever the building is in motion during a earthquake tremor they help in restricting the building from swaying excessively and thereby preventing structural damage. The earthquake energy absorbed by these dampers gets converted into heat which is then dissipated into the atmosphere. Dampers thus work to absorb earthquake shocks ensuring that the structural members i.e. beam and columns remain unharmed. There are four types of dampers i.e. Viscoelastic, Friction, Metallic Yield and Fluid Viscous. Many companies specializing in the field are making a bee-line for establishing operations in India. India's success story of economic growth and the projections for the immediate future, coupled with the heightened seismic activity in the region over the past few years, has led many to look at India as a attractive market destination. 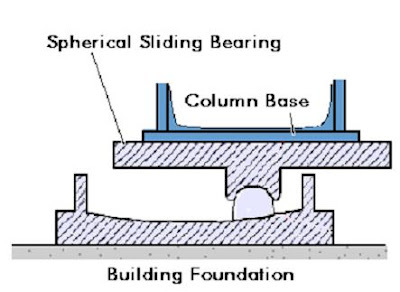 For low-rise buildings base isolation technique is also extremely popular. In Base-Isolation the structure above ground is separated from the foundation by inserting rollers/pads between the foundation and the building. These isolators allow the structure to move independently of the shifting ground below, thereby effectively isolating it from the ground motion. Base Isolation is however not appropriate for all buildings and is suitable for only low rise buildings upto 2-3 storeys that have a much larger spread than its height. Dampers on the other hand are most suitable for high-rise buildings and are in extensive use the world over. High-rises also happen to be the most susceptible to earthquakes. Over the years Fluid Viscous Dampers have come out as clear leaders in seismic applications. Many hundreds of projects have incorporated the technology and the count is increasing by the day. The cost effect for Fluid Viscous Dampers is in the range of Rs. 150 to 200 per square foot, other types cost less however do not come with associated warranties. Dampers manufactured by Taylor Devices have a performance warranty of 35 years which can be further enhanced after testing; however their life is considerably more as they are designed to last more than the building. Dampers can be installed in existing and new buildings with ease. This makes them extremely versatile for retrofit projects i.e. buildings that need to be seismically upgraded to meet the Revised Seismic Codes. In India the Seismic Code IS-1893 was last revised in the year 2002 after valuable lessons learnt during the Gujarat earthquake. There are many who desire their building also needs to be upgraded to the revised standards. Dampers are ideally suited for this job as it requires minimal civil construction works and the job can be easily undertaken with the building being simultaneously in use. Increase of new buildings by installing Earthquake Dampers you can achieve a protection level much higher than the Earthquake Resistant/ Life Safety design. In most structures, the Dampers stay hidden in partition walls and inconspicuous locations and, therefore, are not visible to occupants. However there are many architects who have used the diagonal, A and V placing of the dampers to give an aesthetic appearance. Silvertie Centre in Beijing is presently the tallest building in China and towers 63 storeys. It has dampers installed to counter the adverse earthquake and wind effects so as to preserve the structural integrity. 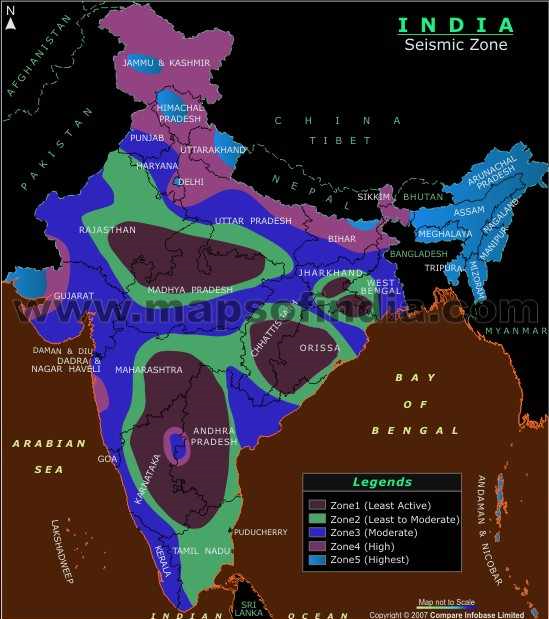 As for the seismic susceptibility, Beijing can be compared to Indian Seismic Zones 3 & 4. There are many propagandists of high-rises who time and again have written about converting the Indian cityscape to resemble those of Hong Kong, Singapore and Dubai. It is important for them to realize that all of these cities fall in the Non-Seismic regions and therefore the architects and structural consultants there only take into account the wind effects while designing structures. India on the other hand falls in the seismic belt and therefore should be compared only to cities in Japan, Taiwan, China, USA ( San Andres fault line) etc. In all of these countries there exist stringent guidelines for tall buildings, it is yet to be seen how and with which regulations the authorities in India confront this issue. Some of the other high-profile buildings incorporating dampers are Sky-bridge of Petronas tower Malaysia, JR Tokai Shin Yokohama station in Japan, Jan-Ron Ritz building in Taiwan, 67 storey Park Hyatt hotel in Chicago, Yerba Buena tower in San Francisco, 55 storey Torre Mayor in Mexico, which also happened to win the award for the best seismically engineered structure in 2005 after the structural engineers monitored the building performance during and post an real life earthquake of magnitude 7.6 on the Richter scale which hit just off the coast of Colima, Mexico (January 21, 2003). Substantial Shaking was felt in Mexico City, but Torre Mayor performed without a scratch. There are hundreds in the list of buildings incorporating dampers ranging from single storey to the highest that the world has seen, a Google search would bring forth hundreds on your screen. Fluid Viscous Damping technology is also used to protect bridges. When used in bridges the orifice of the giant shock absorbers is substantially reduced so as to get what is known as Shock Transmission Unit (STU). STUs are very widely used in all types of bridge construction as they not only help in protecting bridges from seismic effects but also reduce costs by facilitate load sharing amongst various sub and super structure components. Sutong Changjiang river bridge which also happens to be the worlds longest cable stayed bridge uses these devices extensively and so does Nanjing 3rd Crossing bridge which has the title of the second largest cable stayed bridge to its credit. A glance at the photographs/ rendering of these bridges cannot but take our minds to the striking similarity to the Bandra-Worli sea-link. It is to be seen as to what safety standards the Government insists on this project. The metro projects in Seattle and Taiwan also make extensive use of this technology i.e. Seattle Central Link Light Rail and Taiwan High Speed Rail; however we do not come across this technology being used in Delhi which lies in Seismic Zone-IV. Taylor Devices are the leading manufacturers of Fluid Viscous Dampers for the earthquake protection of buildings and Shock Transmission Units for protection of bridges and flyovers. Very well and informative content given about India Real Estate - Highrise Buildings : Now Earthquake Protection With Warranty. Thanks for given this information here about this blog. I need purchase of Diesel Boom Lift used for many purposes such as maintenance and construction work and emergency access.